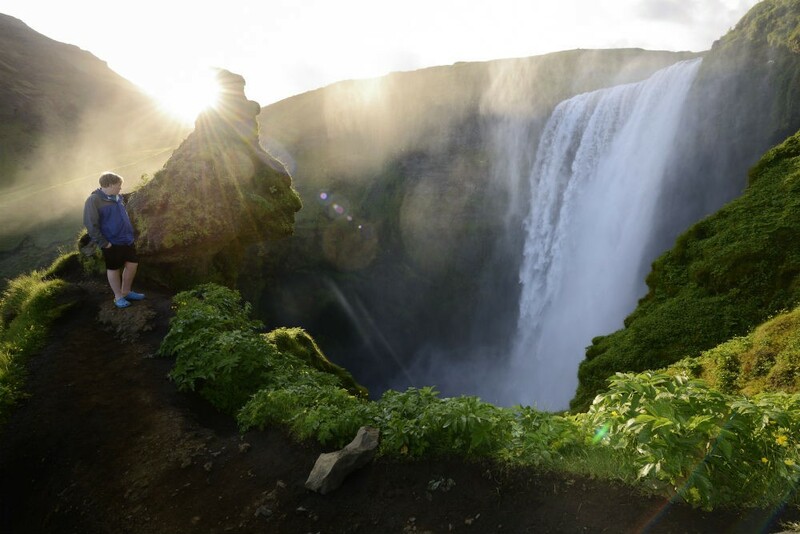 20 Reasons Why You Should Go to Iceland—And One Reason Why You Shouldn’t. Wendy’s husband, Tim, here. I’m the one who surprised her with the trip to Iceland last week. 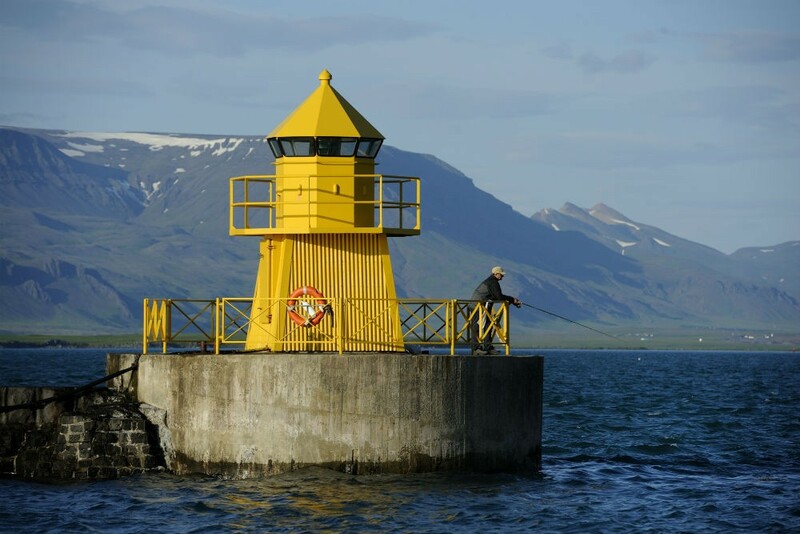 In Iceland you can pack a diverse mix of dramatic landscapes—waterfalls, volcanos, geothermal pools, glaciers, geysers, black sand beaches—into just one short trip. Here’s a taste of what we saw in just six days there. 1. 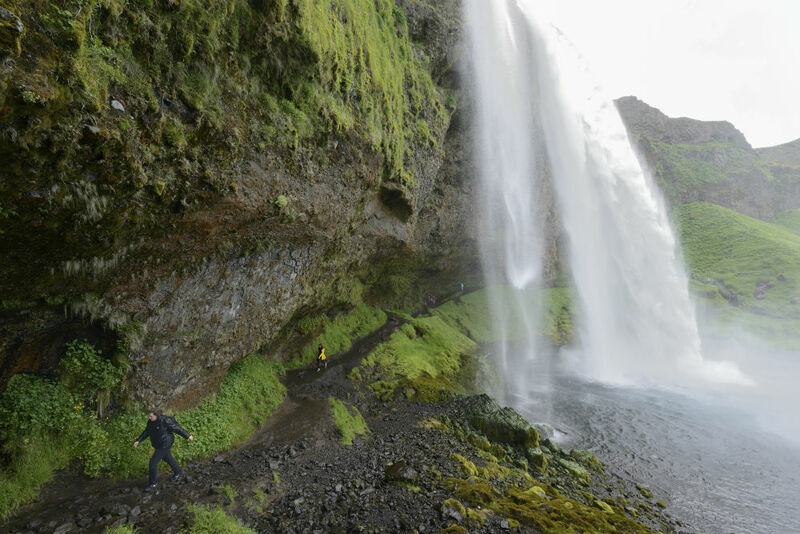 You can hike to a platform at the top of Skogafoss waterfall, on Iceland’s southern coast, but the best view is about three quarters of the way up. That’s where Charlie was standing when I shot this photo. 3. You can walk between the Eurasian and North American tectonic plates at Thingvellir National Park. The plates pull away from each other 2 centimeters every year. 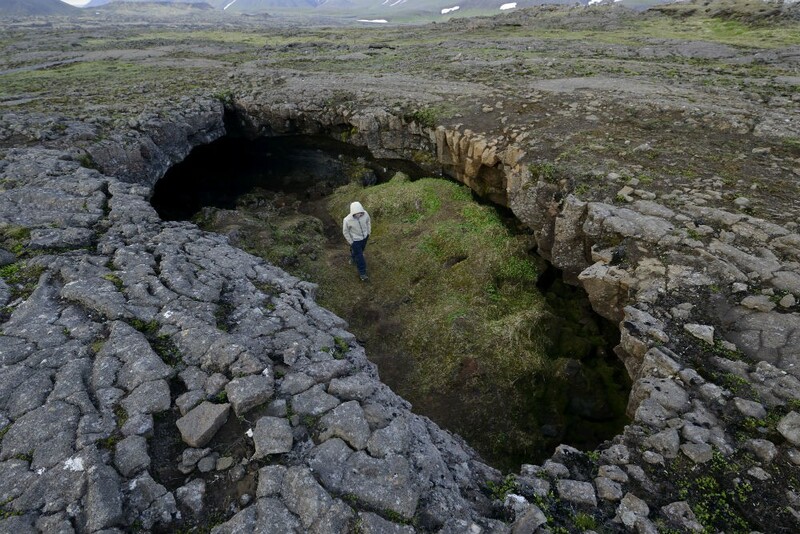 Thus all the volcanic activity in Iceland. 4. 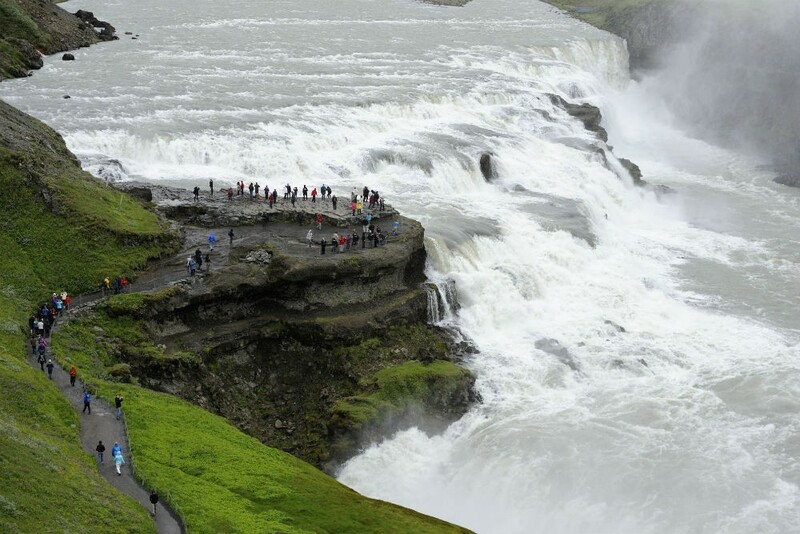 Gullfoss waterfall, one of Europe’s largest, on the Golden Circle loop. 5. Go ahead and rent a car. 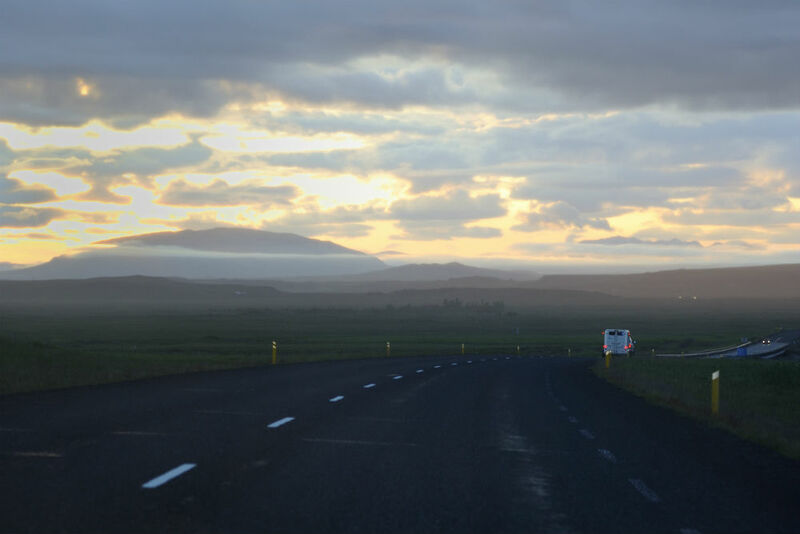 The roads are in excellent shape and quiet, the wide-open scenery makes for stress-free driving, and the 90 km speed limit is strictly adhered to. Just be sure to purchase the windscreen/gravel protection insurance. This is Highway 1 on the southern coast. 6. 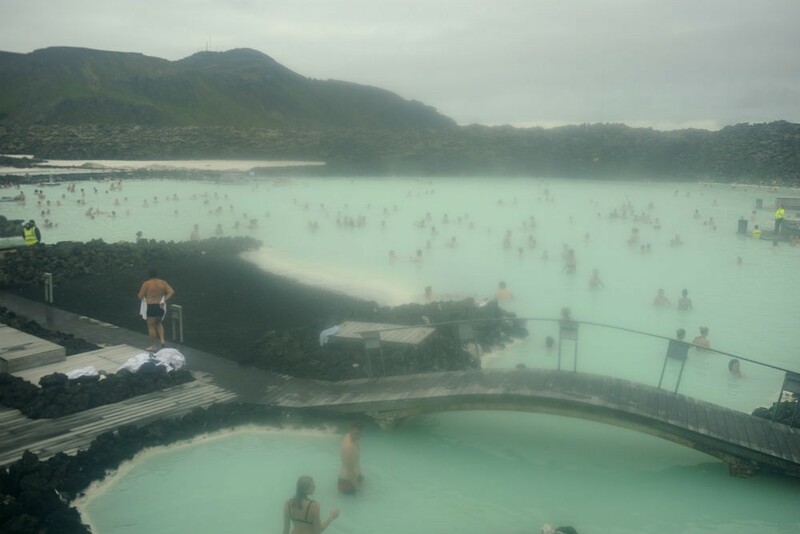 Located en route from Keflavik International Airport to Reykjavik, the Blue Lagoon makes for a reinvigorating antidote to jet lag after a long flight. Make sure you try the silica mud mask. 7. 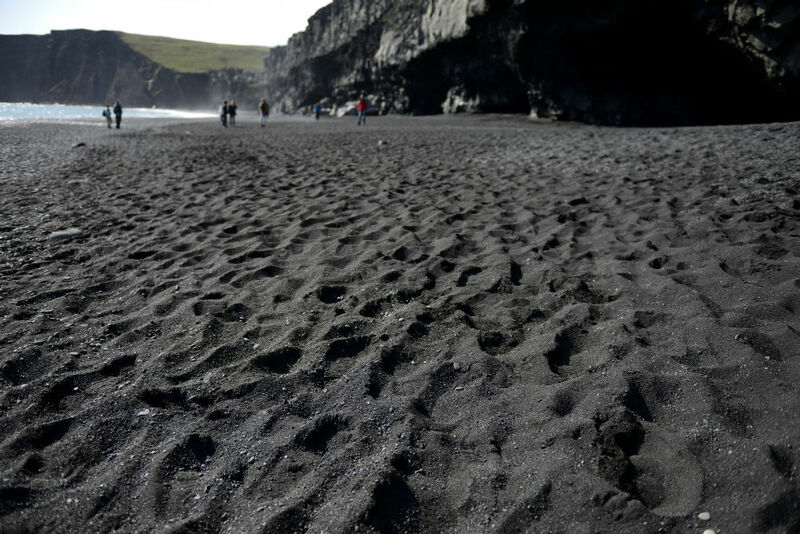 The black sand beach at Dyrholaey, near Vik. 8. 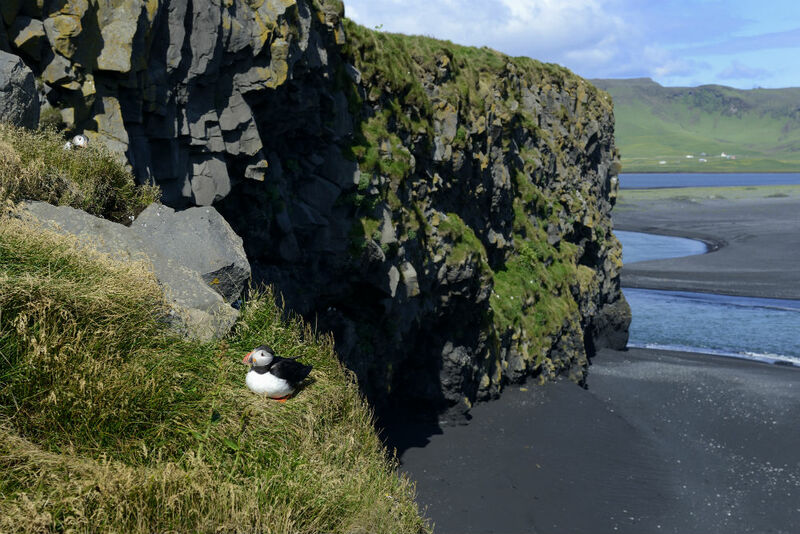 Right off the parking lot for the black sand beach, we got within 20 feet of dozens of puffins nesting on the cliff faces. So there’s no need to spend money on a puffin specialty tour. 9. 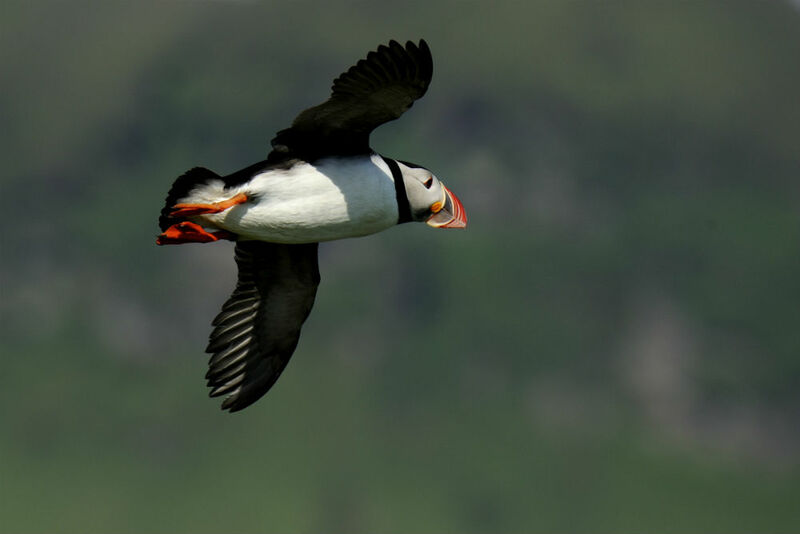 One puffin takes flight. 10. 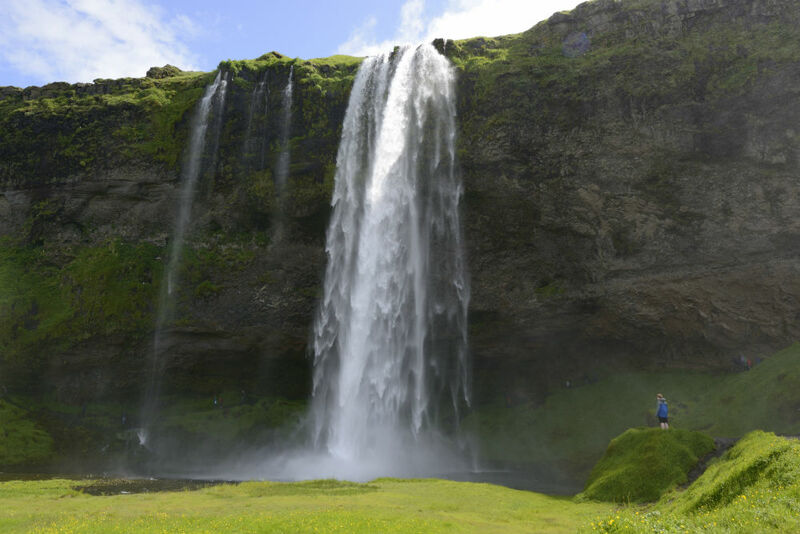 Seljalandsfoss waterfall, on Iceland’s southern coast. This is the waterfall you can actually walk behind. 11. 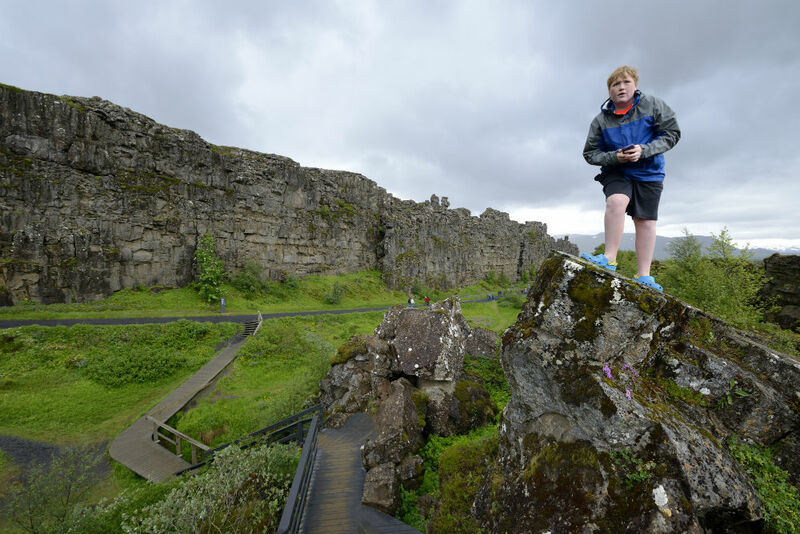 Wear raingear if you plan to walk behind Seljalandsfoss waterfall the way Wendy did. You will get drenched. 12. 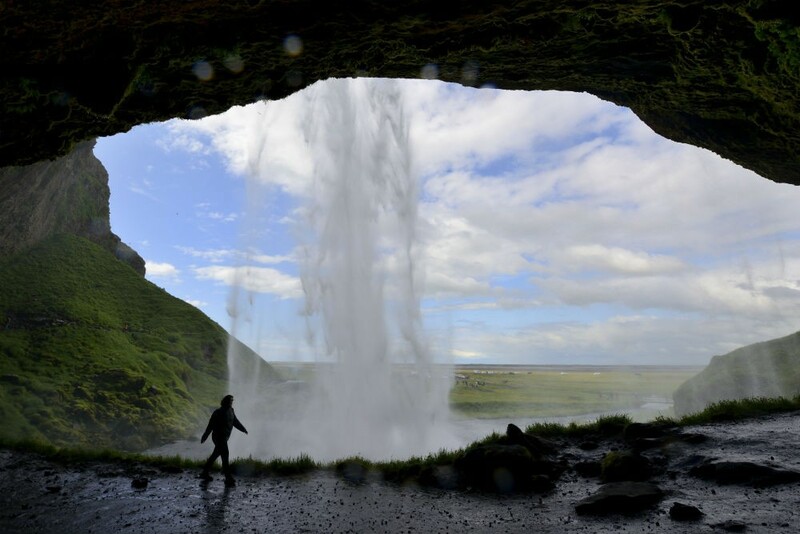 Here’s Wendy emerging on the other side of Seljalandsfoss waterfall. 13. 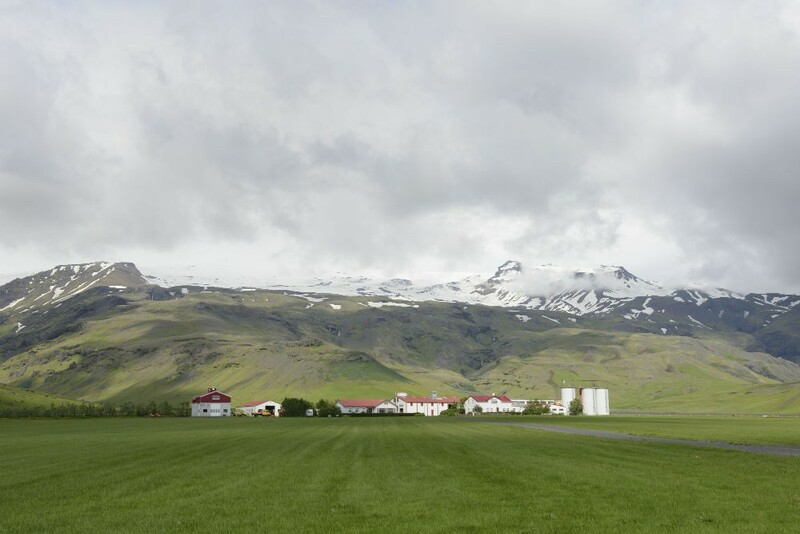 That’s Eyjafjallajokull, the volcano that erupted in 2010, shutting down European airspace for a week. 14. 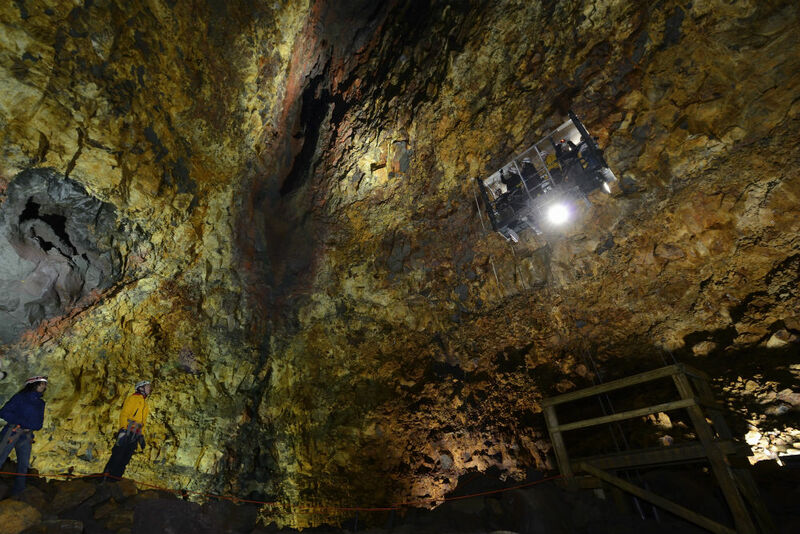 Inside Thrihnukagigur volcano. If you don’t mind heights, and you’d enjoy riding a window washer’s scaffold up and down the equivalent of a 38-story building, and you don’t think the volcano will erupt while you are down there, then the Inside the Volcano tour is for you. It’s like being in a cathedral of geology. 16. 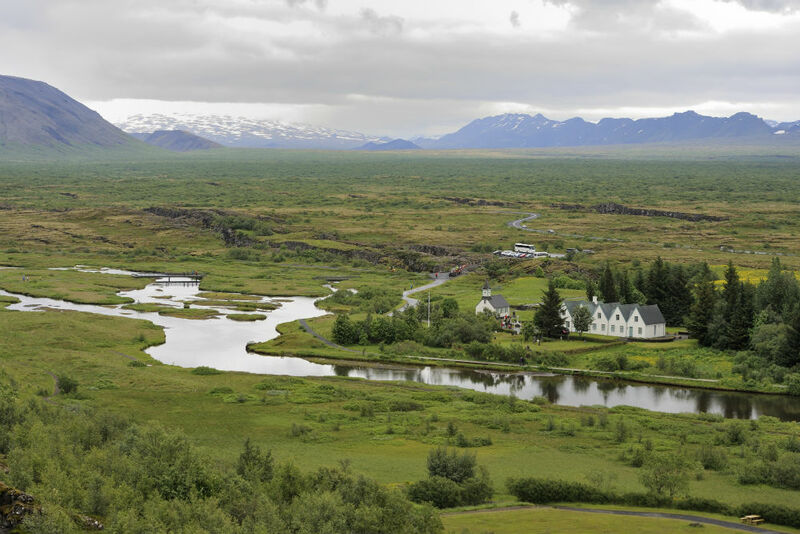 Thingvellir National Park, as viewed from the Mid-Atlantic Ridge—a rift where the North American and Eurasian plates meet. 17. 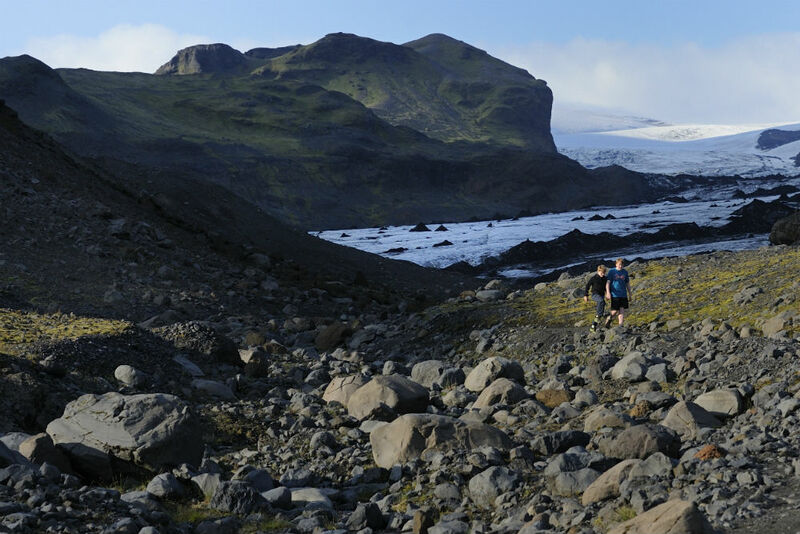 The boys and I hiked back for a closer look at Myrdalsjokull glacier. No fences, no noise, no entry fee, nobody there. We really felt connected with the country. 18. There’s nothing special about this photo, except that it was 11:36 pm when I shot it through our rental-car dashboard while driving. One reason you can pack so much sightseeing into each day in Iceland (in summertime, at least) is that the days are so long. 20. 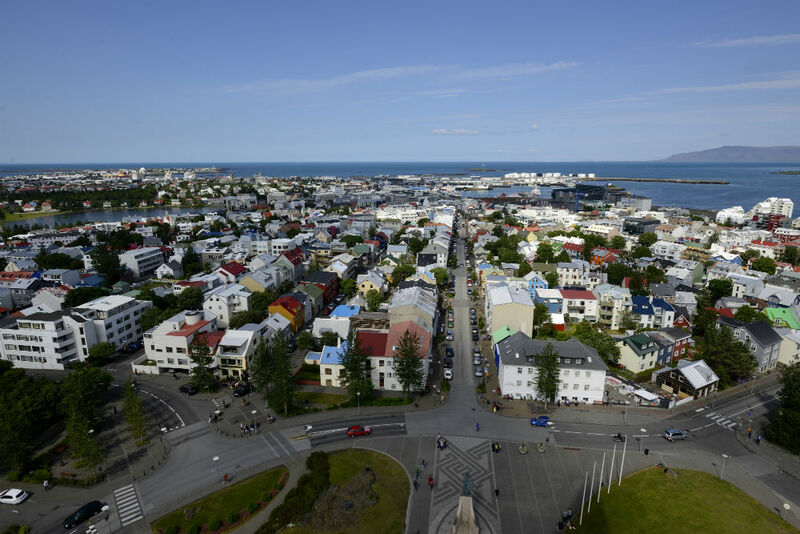 Reykjavik, as viewed from the Lutheran church that is Iceland’s tallest building. 21. 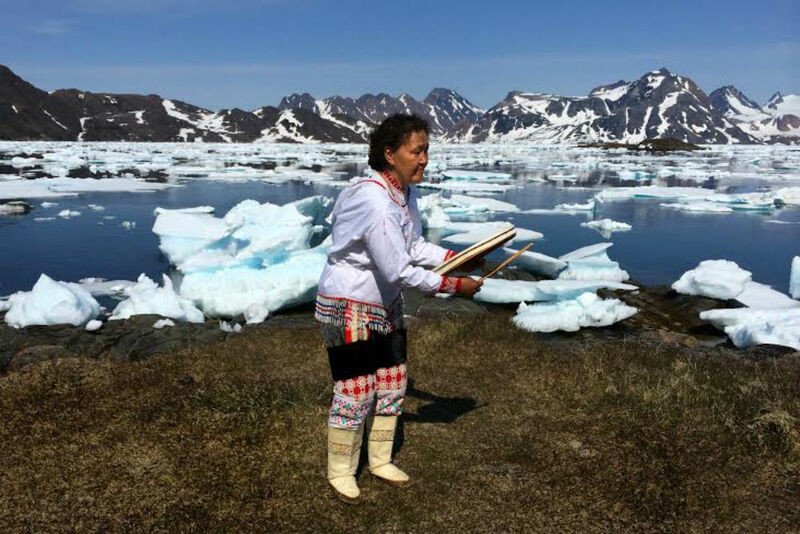 And here’s the reason you might not want to visit Iceland: Whale hunting. On a whale watching tour out of Reykjavik, we saw one live whale…and two dead ones. Two Fin whales had just been killed by a whale-hunting ship in the very spot we were headed to. Fin whales are endangered and the second largest mammal, growing up to be 75 feet long. 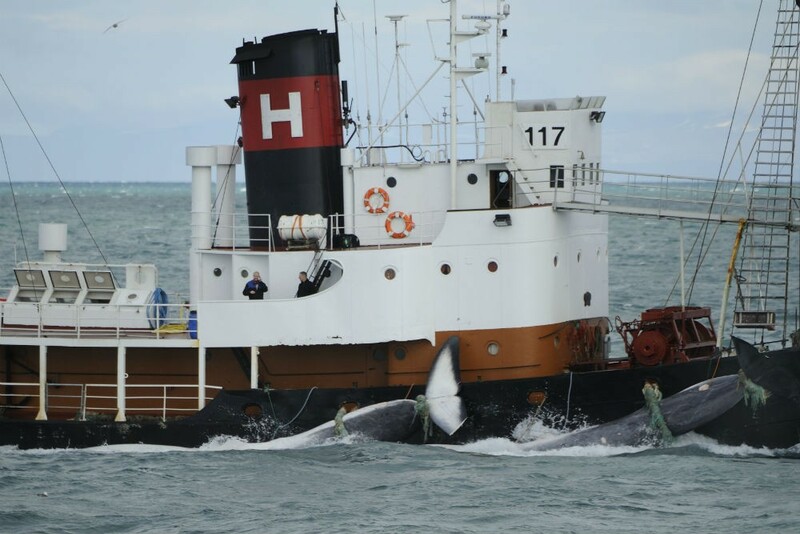 Iceland exports whale meat to Japan. Many good reasons to go, but I really respect you, Wendy, for adding that last and very compelling reason NOT to visit Iceland. This poses a real struggle for me as a travel advisor. I would not want to minimize Iceland’s horrific contribution to the endangerment of these species. Somehow, tourist dollars spent there just seem wrong under the circumstances. I’d like to hear more about what you think we can do in the travel/tourism industry to make a difference. Thank you for your always compelling and engaging blog posts! 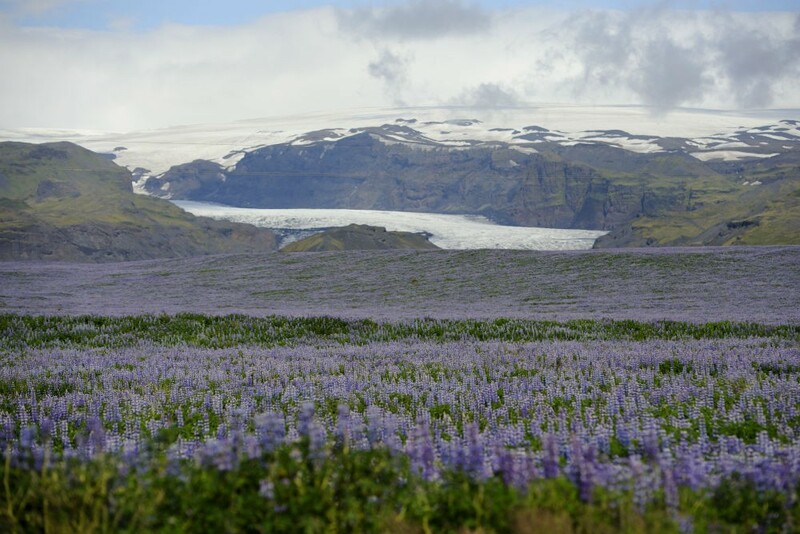 Your photos make me want to go to Iceland now more than ever…and to re- read “Miss Rumphius” (which has a lupine theme) to my daughters! I’ll share these images with my brother’s family,–they’re headed to Iceland next month. Many thanks! 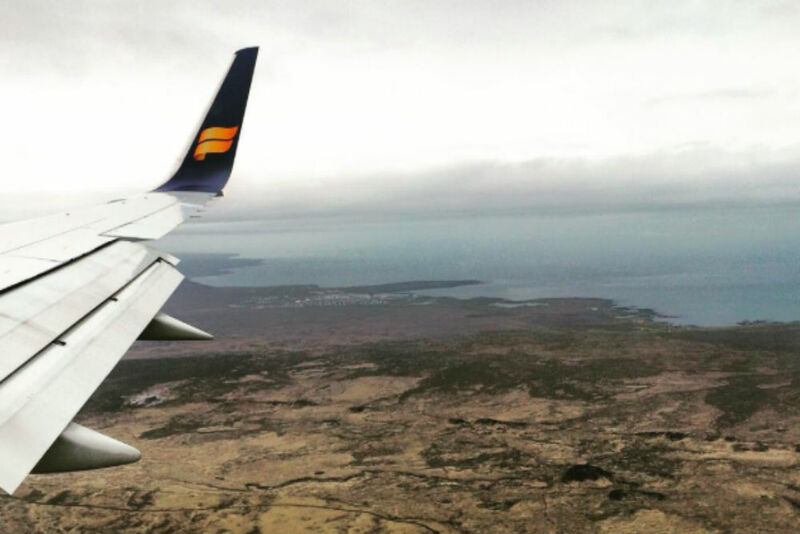 These pictures just bumped Iceland up the l#1 spot for my 2016 summer vacation. The lupines…beautiful. Thank you for this post! A picture is worth a thousand words! 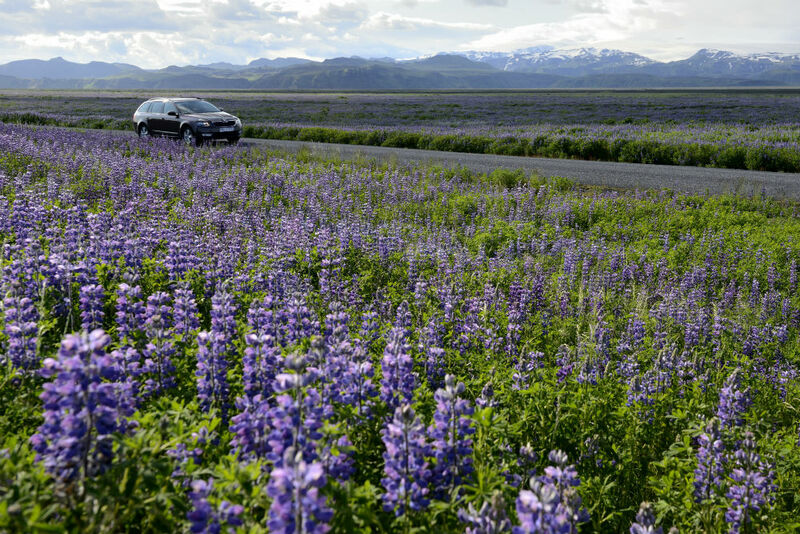 Inspired to visit Iceland in lupine season……. Oh, what great photographs! I really want to go to Iceland! Very cool! 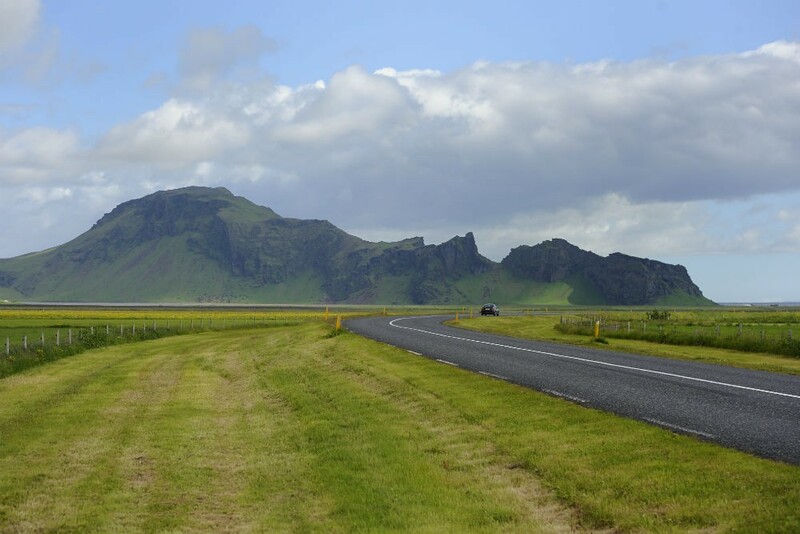 I’ve been wanting to visit Iceland on a stopover but your photos are definitely showing a longer trip would be more rewarding, in summer at least.